I have a feeling that for a while, all breakfast's will be compared to this. And if the gigantic breakfasts at Allen's made me contemptous of Terragusto, well Mickey's Dairy Bar in Madison made me down right evil. The VI family spends a lot of time in Wisconsin, driven (at least for Dad), by three motives. First, the people are especially nice (and in Madison preternaturally nice); second, the scenery; third the food. As I noted the other day, what makes eating so superior in Wisconsin is that all the basics seems so much better. Better eggs, better butter*, better breads, better baked goods, better bacon. And of course, everything comes in larger portions! Mickey's Dairy Bar in the shadow of Madison's Camp Randall Stadium epitomizes Wisconsin. It's got the people. Within a few minutes of sitting at the counter, we seemed to feel like regulars. It's got the scenery, a rather picturebook diner with Badger red tile and Badger red boothes and menus on the wall. It's got the food. The standard breakfast is eggs, meat, "yanks" which is a big ol' mess of potatoes fried in butter, and toast for a bit over $4. As I say, the basic quality is so above average, but what really stood out was the bacon. No one was tauting the label or pedigree of the bacon, and in fact when I asked, no one even knew the brand off-hand, but this was star quality bacon with a nearly excessive smoke taste (remember, nearly...). Pancakes drapped over the side of the plate, each one the thickness of four poker chips. Outta room, we had to take a big chunk of house made blueberry coffee cake to go. Mickey's Dairy Bar is Madison. Mickey's Dairy Bar is Wisconsin. It aint that other place, I can't even remember now. *On the way to Madison, we stopped for coffee in the small town of Evansville. Hungry, the chowhounditas got bagels (which I am not sure is a good thing, no? ), but the butter that came with those bagels. Pure Wisconsin. It was so rich and thick, it was hard to tell at first if it was butter or if it was cream cheese, and only the pale yellow color gave it away. Excellent timing. I'm headed to Madison next weekend. Breakfast is covered. How 'bout dinner? I've scanned through previous posts, and for a city known for its food, the posts seem limited. L'Etoile--would love to go, but it's not in the budget next week. I'm considering the Ethiopian someone else mentioned, but I really wanted something Madison-y. Any recs for lunch or a mid-priced dinner? For lunch or dinner, I'd try The Old Fashioned on the capitol square. It's pretty new and I actually haven't been there yet, but it's operated by the owners of two of my favorite Madison restaurants- Harvest and Lombardino's. Check out the website- I think it sounds really good and very Wisconsin-y. Harvest is excellent, but a little more pricey. Dinner not Real strong in the capitol city. Smokeys Club on University Ave. Old fasioned steak house supper club with decent steaks and good hash browns. Blue marlin for shellfish. No local specialties worth a damn except smoked brats and ice cream. Downtown brathaus may be the best. Badger dairy ice cream on campus should not be missed. On a good morning, coffee and cinnimon cake outside at the Memorial Union adds up to more than its parts. People like the Essenhaus south of the Capitol, but I have never been a fan. On the west side, Delaneys for a pork chop aint a bad option. We tried to hit Mickey's, but it was packed. By the time we came back, they were closing. Bummer. However, we have NO complaints about the places we did find to eat. Instead of going to the Old Fashioned Tavern, which was PACKED and the food looked pretty standard, we went around the corner to the Flatiron Tavern for a spectacular burger (Flatiron burger: angus, black onions, mushroom hash and a slab of blue cheese, ordered medium and actually cooked medium) and steak sandwich (the "Fletch": delicious tenderloin with artichoke brie and ciabatta, cooked medium). I stress the "medium" because so few pub-type restaurants actually cook "medium" when you ask for it. It's either too rare or cooked to death. But they did it perfectly. We had our 1st breakfast at Cafe Soleil, the bakery/cafe at street level below L'Etoile. The most flaky, light croissants I've ever had. The almond croissant is worth the drive alone. For a late lunch (after the sad let-down of Mickey's being closed), we went a block away to a place called New Orleans Take Out. As I've said before, I'm skeptical of any place claiming to do Louisiana/Cajun/Creole food, but this place pretty much nailed the poboy. We didn't try the BBQ shrimp or the shrimp etoufee, but the half-n-half poboy (half shrimp, half oyster...it's not on the menu, but I asked for it, and they were happy to oblige) was great. The poboys are made to order--we sat and watched the guy batter and fry the shrimp and oysters. The shrimp were huge and tender--not the tough, frozen, pre-breaded suckers some places pass off. The oysters came right out of the bucket. The French bread was a bit thick and stale, but easy to get around. Dressed with mayo, properly shredded lettuce and pickles. Sadly, no horseradish available, but a nice selection of hot sauces. Thanks for the report back. I plan on getting back to Madison when the Farmer's Market opens. Our timing was kinda off all weekend long...we showed up at the 'indoor' farmer's market. As it was closing. I did score two HUGE porterhouses and a NY strip, which we'll grill up as soon as we replace our stolen Weber. Speaking of...here's a thought for anyone with a grill who lives in the Pilsen area and doesn't want it stolen: paint that sucker some identifiable and obnoxious color, so when it shows up on Maxwell Street the following Sunday, it's easy to spot. Okay...back to Madison. If I had one rec. above all others, it would be to go to Cafe Soleil. 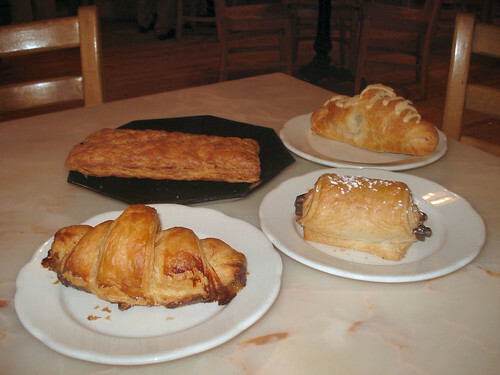 We sampled a variety--the prosciutto/cheese pastry-croissant, the almond croissant, the chocolate croissant, the cheddar/chive scone. They float off of your plate. It's the kind of flake that sticks all over your face and falls into the folds in the crotch of your pants, but you feel absolutely no remorse plucking out of this no-zone and eating. Seriously. And if you're staying in the statehouse area, it really is the perfect pre-breakfast breakfast. It'll make waiting in line at Mickey's much more tolerable. Last edited by crrush on April 10th, 2006, 3:20 pm, edited 1 time in total. I was in Madison this past weekend too. We did try the Old Fashioned Saturday night after less than an hour wait at 8:00 for a party of 12. They handled our large party very efficiently. The food was good, but not as good as I'd hoped for. The apps were great- wonderful freshly battered cheese curds and a lazy susan of cured meats, deviled eggs, fantastic sweet pickles, and tangy cole slaw. I had their signature burger- fried onions, smoked bacon, aged cheddar, garlic sauce and a fried egg. It was pretty good but had a little too much going on for me. Plus, it was overcooked- I requested medium rare and it came medium well. The highlight of the meal for me was the mac and cheese that someone else ordered. Very crispy breadcrumb topping, gooey cheesy noodles and it came with a side of ring bologna. I would have a very hard time not ordering that and the cheese curds in the future for an all cheese meal. Maybe some salami or bologna to round it out. I was happy to hear that about crrush's experience at New Orleans Take Out. I had entirely forgotten about that place. I love the barbeque shrimp- perfectly cooked, spicy, buttery shrimp with a hint of lemon. The dirty rice is addictive too. It will have to be a stop next time I'm in Madison. Thanks for the reminder. If you are looking for something sweet, I would try Michael's frozen custard. There are 3 locations in Madison. Babcock Hall, on campus, has a very good ice cream shop. crrush wrote: We tried to hit Mickey's, but it was packed. By the time we came back, they were closing. Bummer. was packed - just like it was with you. Since I was late, I ended up getting a scrambler to go, I think it was. again - it may be very busy, but its obviously busy for a reason. lbs by now, so maybe its good that I dont. Glad you liked Mickey's. It is, after all, Wisconsin. I'll save comments on my last week's Madison visit for another post. Mickey's - Was there about a month or so ago, and I still love it much. As I noted above, no matter how much food you order, do not skip on the coffee cake. Old Fashioned - We were there then too. It does have a lot of things going for it, and I especially like how they treat Wisconsin food as a cuisine, but yea, as above, our results where mixed. What was really good was the Sheboygan brat and the onion strings. L'Soliel - I like not love the breakfast pastries, finding them overly flaky and not quite buttery enough, but the sandwiches are really special. Of course I love how they feature stuff from the farmer's market across the square. Do note this place is a bit of a madhouse on Saturdays. Madison is a GREAT town! Here's what the breakfast pastries at L'Soleil look like. Stopped by for the first time today, thanks for the advice! Best corned beef hash I've ever had, you could taste the burnt edges as well as some stringy real corned beef, not like most chicago area breakfast places that simply serve the hormel canned version, these guys make it HOMEMADE! The eggs and potatoes were tasty, although I assume they are somewhat drenched in butter or grease. The 2 chocolate chip pancakes could be a meal in itself, great soft texture and buttermilk flavor and very thick... Great bacon with a noticeable smoky flavor as well as excellent sausage, I wish I could have tried everything! I didnt get to try the coffee cake but will return again tommorrow. After living in chicago for 7 years and trying most of the contemporary breakfast hotspots, (bongo room, orange, etc) I wonder why we don't have an old fashioned, quality place such as mikey's, why doesnt anyone make their corned beef from scratch, why are the eggs and even toast here so flavorful? Are they simply buttering everything up? Anyhow, if I lived in madison I would gain 10 pounds a month, some great eats here! Someone posted online about homemade corned beef hash which is more my speed for breakfast. Sweet Willie wrote: Someone posted online about homemade corned beef hash which is more my speed for breakfast. I haven't been there since 2014, but here's what I had last time I was at Mickey's. I think you'll be happy. stevez wrote: I think you'll be happy. Big potato heavy corned beef hash, would have liked more corned beef but a good has none the less. Double smoked bacon was certainly not needed but was eaten & enjoyed none the less.